Even with two feet of snow predicted in the mountains in Northwestern Wyoming, spring is definitely in the air and water. 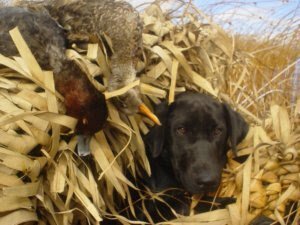 River and stream flows are coming up and making some waters blown out, except the Bighorn River and a few other tailwaters. The river flows on the Bighorn River in Wyoming have been holding steady and the water is clear. Had the opportunity to go out with Doc Ingle, a third-generation native to Thermopolis, and had a great day floating from Wedding of the Waters. Weather was rainy, sunny, calm, and winter-like all in one day. Don’t like the weather in Wyoming? Wait five minutes. Doc had the hot hand and on his first cast hooked into a hog. He caught a nice Yellowstone Cutthroat and this big healthy Rainbow. The blue-wing olives swarmed us after this picture. Sow bug patterns were the go-to fly though. Was great floating with Doc and learning a lot about the history on the area. Thanks Doc and look forward to fishing with you again! Zach Even sent in this photo of his friend, Ashley Bonser, who caught and released this potential Wyoming State record a few days ago. This amazing specimen weighed in at 54 pounds, was 48 inches long, and had a girth of 32.5 inches. Hats off to Ashley for catching this beast and huge kudos for putting it back in the water. 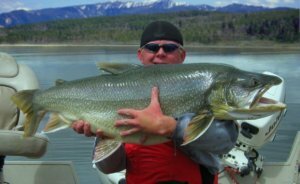 Seeing old lake trout like this pulled out of Wyoming waters makes us want to try these tactics! Who wouldn’t want to catch a fish like that? Thanks Zach and Ashley for sharing this catch. Spring fly fishing in Northwestern Wyoming is definitely as good, if not better than the hot summer months. The baetis are hatching, trout are rising, and are in swing on bwo nymphs. We had the good opportunity to float and demo the new StreamTech Salmon Fly fishing raft/drift boat this weekend. Having only rowed hard boats before, I was excited to see what the rafts could do. I was thoroughly impressed with their tracking, maneuverability, and lightness. Definitely fishing machines! Dunoir Fishing is looking at one of these for those hard to reach waters. Thanks to Link and Becky at StreamTech and Derek Young from Emerging Rivers Guide Service for the chance to row your boat and the great fishing company. Wind River Dubois Wyoming Fishing Guides. Join our seasoned and local fishing guides (fourth generation) on the Wind River nestled in Dubois, Wyoming. Healthy Yellowstone Cutthroat trout are abundant in the Wind River region. The freestone section of the Wind River starts on Togwotee Pass west of Dubois. Many miles downriver the Wind turns into the well-know Bighorn River in Wyoming and Montana. If you want to fish in Wyoming, you must include a stop on the Wind River, or one of the many classic tributaries near Dubois. Whether fishing dry flies, nymphs, or streamers, you will find yourself on the stream alone more often than not. Jackson, Lander, and Thermopolis are a reasonable drive to reach the Wind River and Dubois, Wyoming. DFA guides utilize both public and private access on the Wind River to avoid other anglers. This helps provide a wilderness-like fishing experience. Our guides provide the best fly fishing experience on both the freestone & tailwater sections of the Wind River. Wind River in Dubois, Wyoming (freestone): Offering wade fishing, raft fishing, and stillwater fishing (lakes) by boat. Without question, our guide service offers the most options when it comes to fishing locations and access in Dubois. Children/Family fishing adventures are perfect for many of these waters. Dunoir Fishing Adventures’ owner and family have owned and operated the Ram’s Horn Guest Ranch for over 70 years with four generations of local fishing experience to offer. We are under hire by Absaroka Outfitters allowing us to access all waters on the Shoshone National Forest near Dubois. Wind River below Boysen Dam (tailwater): One of three permitted guide services, Dunoir Fishing Adventures guides in Boysen State Park at the head of Wind River Canyon. This is a great location for trophy-sized trout and scenic views. The Wind River becomes the Bighorn River at Wedding of the Waters located near Thermopolis, Wyoming. Dunoir Fishing Adventures owns 100 acres located on the Bighorn River with private boat access & new facilities coming soon. These trips will not be forgotten due to the history, geology, and of course the wonderful fishing. Expect to catch: Yellowstone Cutthroat Trout, Brown Trout, Rainbow Trout, Brook Trout & Mountain Whitefish. NEW for the 2013-2014 season Dunoir Fishing Adventures will be offering “blast & cast” trips that include fly fishing and bird hunting. Our head guide and outfitter, Ryan Hudson, with many years of fly fishing and hunting experience, will be leading these trips. Blast and Cast trips will be offered on the Green River, Fontenelle Resevoir, and the Bighorn River near Thermopolis, Wyoming. Spring fly fishing in Wyoming is finally here. Enough of those below freezing days, iced guides, and fighting the cold. Baetis hatch is beginning and the Rainbows are starting to spawn (please respect the spawning beds or redds). We are still offering our Spring Drift Boat Special for $300, one angler or two, and includes lunch, flies, and an all day float (offer ends May 1, 2011)! 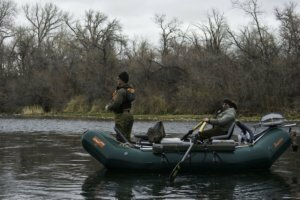 Join us for a day on the Bighorn River in Thermopolis, Wyoming. Starting in May, we will begin guiding on Green River in Seedskadee National Wildlife Refuge. Don’t miss out! Green River Fly Fishing Trips! Dunoir Fishing Adventures is excited to announce that we will be adding the Green River in Seedskadee National Wildlife Refuge to our list of waters we guide. 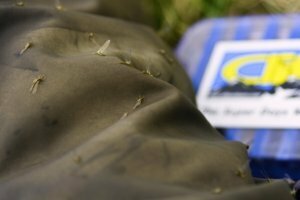 We are pleased to be working for Four Seasons Fly Fishers allowing us to drift boat or wade fish this world class trout fishery. The best seasons are April-June and in October. Contact us for booking details at 307.349.3331! 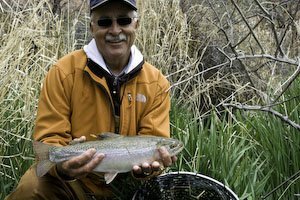 Spring Fly Fishing Special Wyoming! Spring Fly Fishing Special with Dunoir Fishing Adventures, LLC!!! $300 drift boat trips, one angler or two! Don’t miss out on this fantastic offer good through May 1st, 2011! We are a permitted guide service on the Bighorn River, Wedding of the Waters to Kirby, Wyoming! Our permits allow us to get out of the boat and wade fish the best holes on BLM unlike other guides! Join our personable and experienced guides for a memorable fly fishing adventure today. Contact us today! Call 307.349.3331 or email jlprine@gmail.com to book your trip. Looking forward to three days on the Bighorn in Thermopolis, Wyoming with friends and family. Should be great fishing, soaking, and enjoying a three day weekend! Keep posted for photos next week. In the meantime, enjoy a photo sent by our buddy Rick from last weekend. Book your fly fishing trip today. You will not be disappointed! Call 307.349.3331 or find us on our website at www.dunoirfishing.com!